The King of Swords embodies wisdom, thought, and action without emotion. Yes, The King’s a harsh ruler, but he is always concerned with the greater good. Besides, the King of Swords always puts his money where his mouth is. When this King speaks, you better listen. He has no patience for excuses, and he doesn’t suffer fools AT ALL! The King of Swords may be sitting down, but don’t be fooled into thinking he’s resting on his laurels. Yes, his granite throne shows immobility. It means you can’t move him but he can move just fine. In fact, in the King of Swords tarot card the carving on the throne’s back shows intense intellectual activity. He’s not as crusty as you think. The winged sylphs are elemental spirits of air. They’re never at rest. Those butterflies above them show that the King’s ceaseless mental activity has transformed him spiritually. The two moons at the top symbolize the principles of severity and mercy. The King of Swords’ sword points up; it’s ready for action. It’s also leaning to your left, the side of severity. The King doesn’t forgive easily. Under Gemini’s influence, he considers both sides of the issue. But once the King of Swords has made a decision, stubborn Taurus enters the stage. He isn’t likely to change his mind. The good news is that the King of Swords is not a “shoot first, ask questions later” kind of guy, like the Knight of Swords. He’s more like Joe Clark, the famous Paterson, NJ principal who patrolled his troubled inner city school’s hallways with a bull horn and a baseball bat. His “tough love” approach was controversial, but it did restore order. 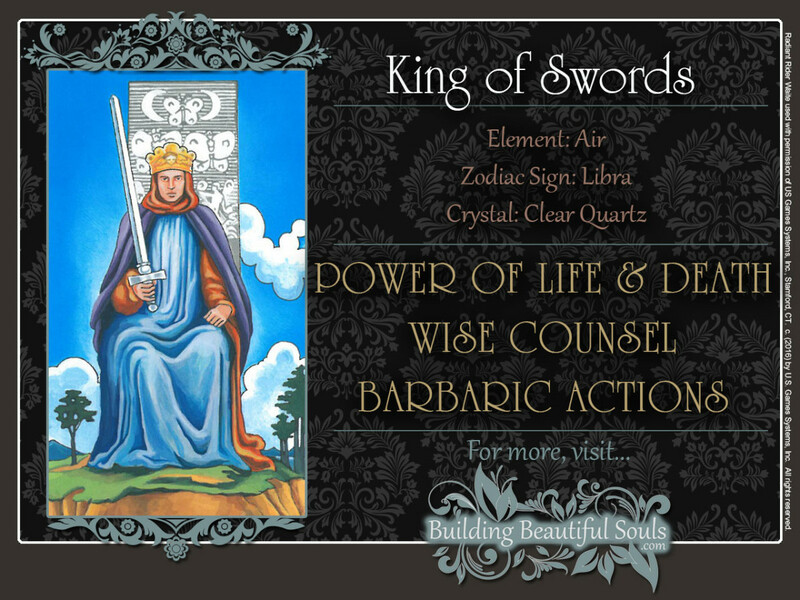 The King of Swords’ actions are forceful, but they produce results. Those storm clouds behind him are calming down. His blue robe symbolizes divine love. The King of Swords’ crown is yellow, meaning that he is guided by spiritual principles. The rich purple color of his cloak symbolizes wisdom. When the King of Swords is on your side, he’ll pull you out of even the worst mess. If he has to drag you by the hair kicking and screaming to make it happen, he’ll do just that. The King is not squeamish at all, when it comes to making tough decisions. He sees his job as restoring and enforcing order. Oh, he won’t coddle you. He’s that best friend who’ll grab you by the shoulder and shake you as he tells you in no uncertain terms that your need to get your ducks in a row. And he’s the chemical dependency counselor who cuts you off in mid-sentence the moment he catches you telling a “war story” or making excuses. His mind is so sharp, he’ll probably catch you before you open your mouth to speak. He knows the rest of your life is more important than sparing your ego. As a teacher, he is harsh but fair. He has mastered the “look” – you know the one that’ll stop you dead in your tracks! He rules by the power of his keen intellect and the force of his personality. If you pay attention, you’ll learn much. The King of Swords is brilliant. Not only that, he’s always thinking about ways to make sure you get what he’s teaching. Yes, the King of Swords understands all the high-level theory, but he also knows how to present it in a down to earth manner. He’s honest and reliable. Once the King of Swords commits himself to something, he’ll do it, no matter what. That can also be his downfall, especially when he has to rely on others or he’s maneuvered into a no-win situation. 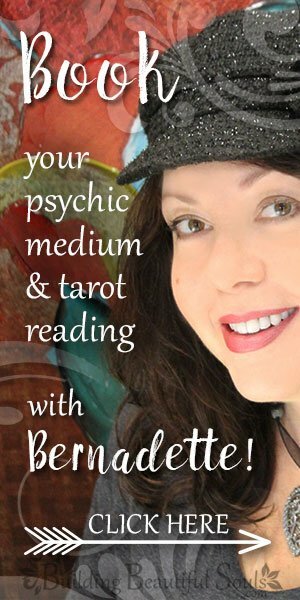 The King of Swords tarot card represents someone who’s a thinker (Suit of Swords) and a doer. He has fought many battles, winning stellar victories and surviving crushing defeats. His wealth of experience has made him wise and practical, but also cautious – sometimes too cautious. In a new environment, he’s is not likely to say much. He’ll spend some time assessing the situation, paying close attention to every detail. Oh, and he radiates an incredible aura of strength that can be unnerving. It’s not a good idea to get on the King of Swords’ bad side. When the King of Swords card is reversed, it suggests that you’ve managed to do just that. Wise and experienced, he generally chooses the side of goodness. But his countless trials by fire have also made him pretty intolerant. This King has a zillion pet peeves and a rare talent for fault-finding. His preferred method of dealing with a problem is dropping the hammer. Prone to anger, he’s likely to overreact when his decisions are challenged by others, especially if he thinks they are inferior to him. Sometimes, his dedication to a greater cause can make him fanatical. He’ll expect others to make the same sacrifices he has made, regardless of their ability. If he can donate a hundred dollars to the local food pantry, everyone else should be able to do the same. Oh, that slacker who actually needs to use the food pantry? Well, he just needs to get a job! That’s how the reversed King of Swords sees it. Sometimes, the King gets so full himself that the line between the greater good he’s pursuing and his own needs becomes so blurry that it disappears completely. Like Louis XIV of France, he’ll spout doozies like, “I am the state.” What’s worse, he’ll actually believe it. There were a lot of dry eyes during his funeral. Obsessed with holding onto his power, he’ll often abuse it – and that can become his undoing. On the other hand, the King of Swords tarot card can also point to a person experiencing great difficulties. Sometimes, that may be his own fault, because he hasn’t learned from his experiences. It can also mean that his struggles have weakened him to the point where he can no longer regain his strength without help from others. In the tarot, Kings are associated with the number 2. Kabbalistically, this number is associated with the sphere of the zodiac, where all major decisions are made. In traditional Numerology, 2 corresponds to the moon and the astral world. Here, it emphasizes duality. The King’s sword cuts both ways.